Building Canada’s tallest waterfront tower on Etobicoke’s former motel strip doesn’t make Mike Menneguzzi an expert on stacked housing. You can’t get much more stacked than piling 66 floors on top of each other, as planned for Water Tower, the second phase of Empire Communities’ Eau du Soleil project near the mouth of Mimico Creek on Etobicoke’s waterfront. But that’s not stacked housing. When there’s a ground-level front entrance for a residence that floats two or three floors above grade—that’s stacked housing. 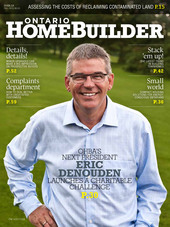 Menneguzzi is tackling both styles of home construction as president of high-rise construction at Empire Communities. While preparing to erect the massive waterfront tower—yet to earn municipal approval—he is also concentrating on building Ten88 Progress, a development of stacked townhomes on Progress Ave. at Sheppard Ave. in Scarborough. Stacked housing is a rather new concept in higher density housing, although the concept may have been triggered back in 1967, when Montreal architect Moshe Safdie unveiled his design for Habitat 67, a unique apartment structure, as an Expo 67 pavilion beside the St. Lawrence River. Although not all the 354 units in Habitat had separate ground-floor entrances, each had their own private green terraces and didn’t share a corridor with the other residences stacked in a seemingly random order up to 12 storeys. Habitat 67 was composed of separate concrete boxes, but most stacked housing projects in the Toronto area are “stick built.” Creating affordable housing is the principal raison d’etre for the design. On a warm day in July, a busload of OHBA members toured various stacked housing sites in Etobicoke and got to talk to the construction superintendents erecting them. Paul Kennedy, an architect with Cassidy & Company, was aboard the bus and helped explain the difference between stacked housing and row housing. “Townhouses, typically, are usually two- and three-storey dwellings that share common party walls, in groups of three units up to as many as eight units, depending on the zoning and Site Plan Approval requirements,” says Kennedy. “Each dwelling has its own rear yard, private driveway, garage and private entrance from grade level (or sometimes a ‘raised entry’ as part of the designer’s overall concept). Townhouses are the next level up from single-detached and semi-detached housing in terms of density. “Stacked housing, in simple terms, takes the townhouse concept and literally stacks one unit on top of the other,” Kennedy explains. “This is where the density increases. Stacked housing forms can vary widely, with two-storey on two-storey, or two-storey on one-storey (bungalow). The building form is three or three-and-a-half storeys, fitting into the ‘low-rise’ description of housing. It’s an effective form of housing design and construction that increases density, but still utilizes wood frame construction. It is primarily pricing that is attracting buyers to Southshore, a stacked townhouse project by Minto Developments in South Etobicoke. “Our buyers are coming here because they can live in south Etobicoke near the lake for less than $400,000 and be within easy transit commuting to downtown Toronto,” notes Jessica Simpson, sales manager at Minto. Southshore has 40 two- and three-bedroom homes under construction in Long Branch, four blocks north of Lakeshore Blvd. and 10 blocks east of the Long Branch GO Train station. It’ll have underground parking, and prices on two-bedroom apartments start at $360,400. Mike Memme of Mountainview Homes in Niagara Region joined the tour, but said Niagara does not yet have high enough density to consider building stacked towns. “I wanted to see them being built and I wanted to talk with the sales agents to see how they present them to the consumer and what the consumer is looking for,” says Memme. Mike Mescia is interested in the concept. He and his father Dominic operate Domus Developments in London and have two stacked housing projects underway and two more in the works. Woodland Village is a rental project just north of Western University and Masonville Place. “We are going to be adding stacked townhouse condos on North Centre Rd. within Woodland Village. They’ll be stick built to keep construction costs down,” says Mescia, whose company won an OHBA builder award in 2001 for the best condo townhome project in Ontario with their Lakeview Development in Port Stanley. As well as visiting various stacked housing projects, the bus riders also got to talk with Paul Golini, immediate past chair of BILD and co-founder of Empire Communities. Golini explained the design concept proposed for the 66-storey Water Tower project at Eau du Soleil. The project is currently before the Ontario Municipal Board. If approved it will be the tallest waterfront building in Canada, notes Tarek El-Khatib, senior partner at Toronto’s Zeidler Partnership Architects and the principal architect on the project. Empire, in partnership with Pace Developments, has stacked housing projects in Vaughan (Villagio) and a joint-venture project at Ten88 Progress in Scarborough. Villagio is on Keele St. just south of Major Mackenzie Dr., with homes starting at $299,990. Prices start at $189, 990 for one-bedroom suites at Ten88 Progress. The tour also covered W&E, a stacked townhouse joint venture by Fernbrook Homes and Cityzen Development Group at Widdlecomb & Eglinton (hence the project name W&E). He said no elevators, as well as no swimming pool, gymnasium, weight room, squash courts, etc. keeps the monthly maintenance costs down substantially compared to the high-rise condominiums some of his buyers are coming from. Since every suite gets a gas BBQ, gas BBQ connections on rooftop patios are a big hit, Ankin says, particularly with the younger buyers. Darlene Fraser, a veteran of new-home marketing in the GTA is now sales and marketing director at Eastforest Homes in Kitchener. She says stacked housing is very popular in the Kitchener market. Eastforest builds a wide range of homes, from million-dollar custom homes to single-family, townhomes, semis, quads and stacked housing. Prices in stacked housing at Huron Landing start at $149,990 for a one-bedroom unit with 553 sq. ft., and range up to $194,990 for two bedrooms and 963 sq. ft.
Remington Group isn’t building stacked towns yet, but does have townhomes among its wide selection of homes styles in development projects throughout Ontario. If they do venture into stacked housing, they’ll have a knowledgeable employee when it comes to design feature. Susan Ferrigamo works at Remington’s design centre and she concentrated on design features and finishes during her tour of the Etobicoke projects. She was particularly pleased to see what Fernbrook and Cityzen will be building on Eglinton Ave. near Martin Grove Collegiate, her alma mater. Cedar Point’s Luciani, meanwhile, has been a new-home real estate broker in the GTA for 25 years and involved in the sale of more than 7,000 homes. 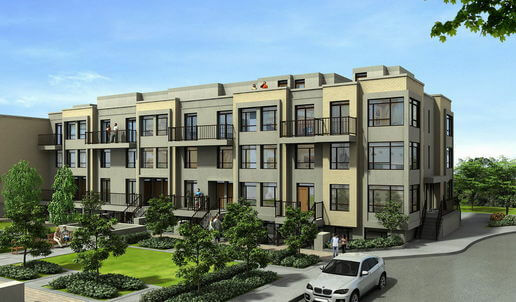 A current client, Solotech Corporation, is building 32 stacked townhomes on Gerrard St. E. at Main St. in Toronto’s Upper Beaches neighbourhood; its attractive pricing beginning in the high $300,000s. Luciani says the project is drawing buyers out of the high-rise condos abutting the Rogers Centre.